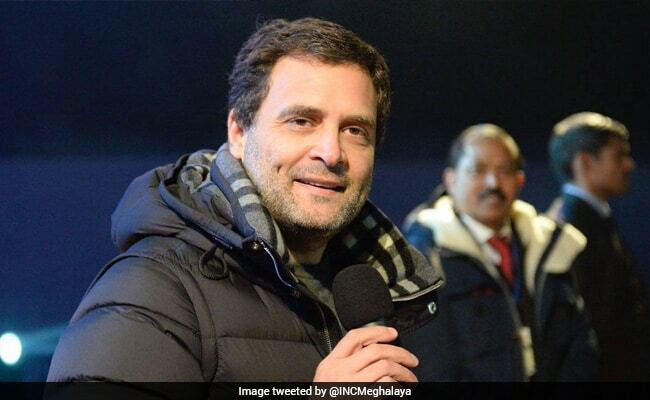 Rahul Gandhi barely spoke for five minutes at the 'Festival of Peace' concert as he listened to the musical bands enthralling the 4,000-plus crowd, who braved a cold winter evening to attend the festival. Rahul Gandhi was dressed in blue denim trousers and a black jacket at the event. Shillong: Dressed in blue denim trousers and a black jacket, Congress president Rahul Gandhi on Tuesday attended a party-organised concert in poll-bound Meghalaya, in a bid to reach out to young voters. The Congress has been in power in the north eastern state for nearly 15 years. Mr Gandhi barely spoke for five minutes at the 'Festival of Peace' concert as he listened to the musical bands enthralling the 4,000-plus crowd, who braved a cold winter evening to attend the festival. "We are strongest when we stand together in our diversity. India's strength is our diverse culture and different languages, different ways of thinking," he said as the crowd, including a large number of women, cheered him. Mr Gandhi urged the youths to love and respect each other to make the country strong. "When we fight each other and spread hatred, we are not strengthening our country but weakening it and disrespecting our people, our past and our future," he said. Asking the people to be proud of their heritage, language and religion, the Congress president said, "We are all proud of you and we will defend your way of thinking". Stating that every single person from all states has a space in the country, he noted, "Their dreams and aspirations are equally important, no matter how small or big a state is". The Congress, which has been in power for nearly 15 years in the state, organised the concert to woo young voters for the February 27 elections. Noted bands such as 'Soulmate' and 'Emperical Tribe' besides cultural troupes of the Khasis, Jaintias and Garos performed at the festival.